Deconstructivism in architecture is a development of postmodern architecture that began in the late 1980s. The building designing is dependent upon the construction technology, majority of functions are streamlined and computers are playing the major role in it. It mainly covers the designing of multidirectional ambiguous spaces and forms creating optical illusion. The basic concept project is to give the look of a ship with its sail at full mast and the designer wanted to create the feeling of square-foot Concert Hall having 2,265-seat auditorium with natural lighting in which the audience surrounds the orchestra. The auditorium has a curved wooden ceiling which fulfils the acoustical requirements. 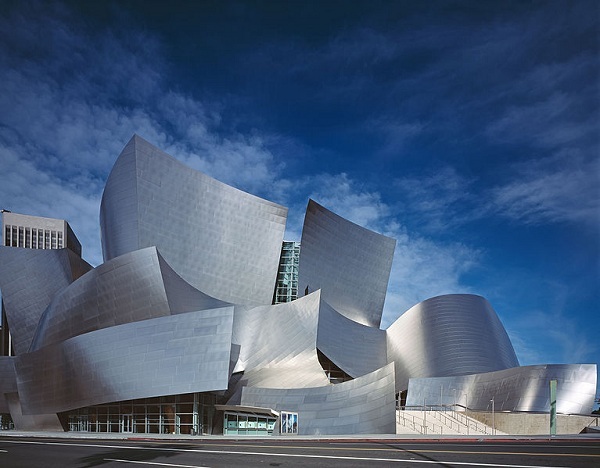 The dramatically curved exterior of Walt Disney Concert Hall is clad in 22 million pounds of primary steel joined out of 12,500 individual pieces that range from 13 inches to 110 feet long. None of the pieces are identical. They weigh as much as 165,000 pounds. The pieces are placed end to end, the steel pieces would stretch to long distance. Contrast has been created by having the auditorium and many of the smaller performance areas in the four-storey concert hall are filled with the warmth of Douglas Fir wood featured on floors, walls and ceilings. In addition, the abstracted floral patterned carpet and upholstery were designed in tribute to Lillian’s love of gardens and gardening. Folding and unfolding of spaces with visual imbalance makes the building interiors and exteriors fascinating. Three-dimensional module adopted for the working drawings in computers was transferred to the site by laser transmit method to locate building corners with X, Y and Z coordinates. Construction materials, finishes are used in such a manner that it gives the unconventional looks.